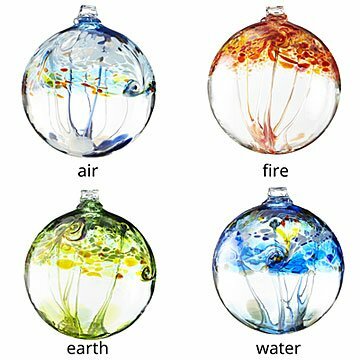 Celebrate the symbolism of nature's elements with Stephen Kitras' elegant 100% recycled glass globes. Are You an Earth or a Fire? Are you inspired by water's powerful movement? Or earth's ability to lay roots? Celebrate the symbolism of nature's elements with Stephen Kitras' elegant 100% recycled glass globes. Made from melted down shards of glass used for car, home, and office windows, each is blown into beautiful works of art featuring vibrant splashes of color inspired by the elements. Handblown in Canada. Fire: Alive with new ideas and new opportunities, fire finds the spark of one's inner intention and drive. Water: With powerful movement, water links us together to achieve what one could not accomplish alone. Earth: Where we lay our roots, earth moves through cycles of life and re-birth, adapting to adversity and seeking solid ground. Air: A reminder there is more to the world than what's visible, air moves things that are stuck and ushers in new beginnings.